The E-Commerce Leaders’ Playbook is an exciting annual publication which featuring interviews with industry leaders such as The Iconic, Catch Group, eBay and Alibaba, consumer statistics and insights into technology which is transforming the retail industry. 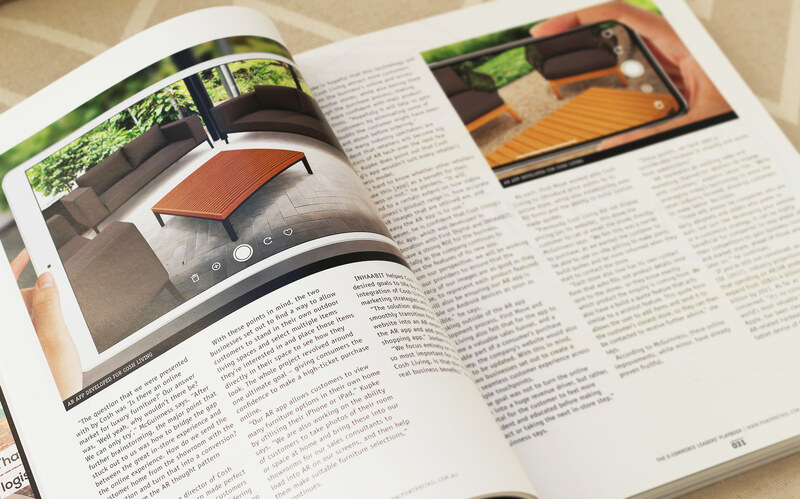 The 2019 Playbook features a multi-page indepth interview with INHAABIT about the release of the Cosh Living AR app, how Augmented Reality compliments the sales funnel and helps consumers make more confident purchase decisions. Colin Kupke, director of Cosh Living explains, “It is often difficult for customers to imagine furniture they are considering buying in their own home, and our AR app now bridges that gap”. With Augmented Reality related products and services set to reach US$215 Billion by 2020 (IDC), many of the interviews in the Playbook touch on the importance of understanding AR in the retail space. Similar to developing a website or digital strategy, it can be highly beneficial for companies to leap ahead of their competitors with AR, to gain valuable business insight and market share ahead of companies who start later on. The Playbook also unveils the coveted Top 100 Online Retailers and retail category winners from the 2019 Power Retail All Star Bash awards. The E-Commerce Leaders’ Playbook is available via Power Retail’s website. Jason is the Director of Marketing at INHAABIT and has over 20 years experience creating digital solutions in areas of design, UX, branding, digital marketing & Augmented Reality.